Always remember that there is only one person in charge of a team and that is the Skip. Whatever the Skip asks you to do, you must try, to the best of your bowling ability, to achieve. You may sometimes disagree with the Skip’s judgement in asking you to play a particular shot, but irrespective of this, you must obey the instructions given. As a beginner, you will probably start your career as a team player in the Lead position. Learn to bowl the jack to a particular length your Skip might require. Remember when leading to consult with your Skip regarding length of jack and the position of the mat. Remember that a bowl behind the jack is better than a bowl one yard short. Try to find a hand you can play well and stick to it where possible. Being able to play a bowl into a particular position that the Skip requires is essential in team play. When you take part in team play do your duties efficiently. Have confidence in the judgement of your Skip, and bowl to his directions as best you can. Always be attentive to what is going on in your rink and do not get absorbed in what is happening on the next rink. At all times ensure that the Laws of the Game are being observed by you. Always be suitably dressed for playing bowls. Do not wear clothes that restrict the free movement of your arms and legs. Never bowl wearing a jacket or blazer. To bowl well it is essential that you feel good, so try to leave your everyday worries behind you when you step on to the green. Finally, remember the golden rule, if you can’t get shot, try to get second. Lead: The Lead shall place the mat ensuring that it is a regulation mat and shall deliver the jack ensuring that the jack is properly centred before playing the first bowl. Skip: The Skip has complete charge of his/her team and his/her instructions shall be observed by the players. With the opposing Skip he/she shall decide all disputed points and when both agree their decision shall be final. If both Skips cannot agree, the point in dispute shall be referred to, and considered by, an umpire whose decision shall be final. A Skip may at any time, delegate his/her powers and any of his/her duties to other members of his/her team, provided that such delegation is notified to the opposing Skip. The Captains or Skips toss a coin to decide which side will play first. When the choice has been made, the Lead will place the mat, roll the jack and deliver the first bowl. In placing the mat, the Lead will ensure that it is positioned lengthwise on the centre line of the rink, on the first end the back edge must be four feet from the rear ditch. The Lead will need to sight along the rink, using the centre pegs as a guide. The Skip, from his position at the other end of the rink, may check the positioning of the mat, and direct adjustment where necessary. After the first end the mat may be placed at any point along the centre line of the rink, provided that its back edge is not less than four feet from the rear ditch and its front edge is not less than that required by Rule …. The Lead then rolls the jack, ensuring that it is properly centred after it has come to rest. If it stops less than two yards from the opposite ditch, it will be moved out to that distance before being centred. If the jack has not been delivered from a proper stance on the mat, if it ends in the ditch, outside the rink or less than the distance allowed by Rule… in straight line from the front edge of the mat, it will be returned and the opposing Lead will deliver it, but will not play first. The Second’s main task to to consolidate or retrieve the head. He/she will be expected to deliver his/her bowls to a variety of positions, so he/she must be accurate at drawing to any part of the rink. Before play commences, the Second should ensure that the names of all players are entered on the score card. He/she should then keep a careful record of all the shots scored for and against his side throughout the game and check the score regularly with the opposing Second. He/she should also adjust the score board at the completion of every other end. After the completion of each end, the Third is normally given the responsibility of agreeing the score with his opponent. If agreement is not reached, the appropriate bowls are measured by one of the Thirds. The Third usually changes the score board at the alternate end, when the Second is at the opposite end of the green. The Skip is in charge of the four and his/her instructions will be observed by all his players. It is his responsibility to direct play, build the head and decide the tactics. The Skip must have a thorough knowledge of the game. He/she must be able to instil confidence in each member of his/her team. His/her directions should always be definite and positive. He/she should be fully aware of each player’s strengths or weaknesses and plan his/her tactics accordingly. He/she knows that a bad shot calls not for condemnation but constructive suggestion, and that a good shot deserves a word of congratulation. Above all, a good Skip needs to be a good diplomat. Be conversant with the laws of the game. Many bowlers are not. Check to ensure that when you adopt your stance on the mat, you are facing the shoulder of the arc of the hand you wish to play. Remember to be perfectly balanced and relaxed – with knees slightly bent if bowling from the athletic position. Make sure your whole body flows through with your delivery, from the hand which delivers the bowl to the back foot that lifts gently off the mat. Be certain that there is no stiffness in any part of it. Be very aware of the pace of the green and the general conditions, because your arm-and-leg movements will be governed by them. The faster the green, the more alive the bowl will become, and the more sensitive the touch required. On heavier greens the bowl should be held more firmly, but on faster surfaces it should be caressed by the fingers and the whole mechanics of delivery are more delicate. The movement is slower, the backswing shorted and with the long, graceful follow-through the delivery becomes a gliding movement. Having estimated weight by looking at the jack, keep your eyes firmly fixed on the shoulder of the intended arc when delivering the bowl. Keep your head down until after the bowl has been released. Practice, practice, practice and try to become proficient in all the shots in the game. Remember that there is a perfect weight and green combination for every shot attempted, and nothing gives more satisfaction than to apply it successfully. Mastery of this combination is the hardest part of the game, but the ability to play shots with perfect weight and green in a great asset. Their precise quality is a joy to behold to the onlooker. Always be positive when you step on the mat. Be sure of the shot you wish to play. Always stand well back from the mat when your opponent is in play. Never be over eager to play your wood. Take your time and fully assess the position before you bowl. Remember to use the mat and jack intelligently. Have a sound reason for every tactical move you make. When you are playing in pairs, triples or fours and you are not the Skip, always remember it is a team game. There is only one person in command so mould your play to their wishes. Four players, no matter how good, playing their own games, will never be a really successful side. When playing Lead or Second in a four, encourage your Third and Skip, but do not let your enthusiasm run away with you to the extent of becoming a nuisance and overcrowding the head. Remember the Third and Skip are in control, and other players should keep well back where they can still take an interest without interfering and confusing the issue. When in trouble, remember that more often than not, it pays to play for second bowl. Your opponent cannot go far on singles only. Watch your opponent’s game carefully and look for weaknesses which you may be able to exploit profitably at a suitable time later in the match. In singles play you cannot afford to waste a single bowl and these games are the ones in which it is easiest for a bowler to build up or improve self-discipline and deep concentration. Take pride in building up deep concentration and willpower, but remember it is still only a game, and do not let the result get out of perspective. Train yourself to think deeply about the game and in practice be prepared to experiment. It is the only way to learn and your tactics and general knowledge will improve steadily. Remember that few bowlers succeed in top-class play unless they have excellent temperaments. Set out to be an example to others on the green. Sportsmanship costs nothing. A player who is a true sportsman will always be an inspiration to his/her team and the serenity and coolness that accompany his/her will be conducive to better play, with partners being completely relaxed but still concentrating to the full. Never throw the jack. Take your stance on the mat as if you are bowling a bowl and endeavour to bowl the jack to the distance at which you hope to obtain maximum advantage. Don’t run off the mat when delivering your bowl. Take your time. Too many bowlers green 75-80% of their bowls narrow. Don’t be one of them, as a slightly over-greened wood is invariably better. Don’t allow your eyes to wander when delivering a bowl. Keep them fixed on the shoulder of the intended arc. Don’t let yourself be distracted by shadows or movements. Wait until everything is still before you bowl. Don’t relax when you build up a big lead. There will surely come a time when you will regret it. Don’t be too hasty in deciding which shot to play. Study the head carefully for there are usually many more possibilities than are apparent at first glance. Don’t fire unless you have studied the head carefully and are absolutely sure no better alternative exists. Indiscriminate firing when the position is against you can, and often does, cost the match. Never let your opponent think he has you rattled. Whatever the fortunes, appear serene and cheerful and concentrate your thoughts on how to pull those shots back and reverse the mental pressure. Don’t let your opponent dictate the pace of the game. You cannot rush a game or bowls and give of your best. You should play at your speed and let him play at his. The rule dictates that at the start of play the mat must be laid on the centre line of the rink with its front edge exactly six feet from the edge of the rear ditch. If the mat is flipped or moved off the centre line by a bowler, then it can be replaced along that line, but no other movement of the mat is allowed during the playing of the end. Since the mat is the starting point of every delivery, then care should be taken in the laying of the mat. The Player who has the right to lay the mat must always remember the six foot rule, and must lay the mat so that the right and left sides of the mat are equidistant from the that the jack cannot be rolled the minimum distance allowed by Rule …. At the completion of an end, the mat is lifted by the last player and placed beyond the limit of the rink. Do not, even in social play, merely drape the mat on the bank for subsequent convenience of access. As with so many other aspects of the fame, your position on the mat is a matter of individual preference. There is only one rule to follow: at the moment the bowl touches the grass, at least all of one foot must be wither on the mat or directly above it – that is, entirely within the confined of the mat. 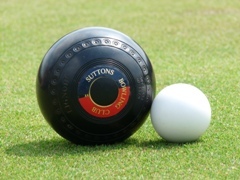 Most shots in the game of bowls are directed towards the jack or getting as close as possible. Therefore, delivering the jack the distance you require (or your Skip requests) is most important. But the jack must never be delivered less than the length required by the Laws of the Game. After delivering the jack it must be lined up with the centre of the green. Your Skip will centre the jack on your instructions; i.e. indicate approximately how far the jack needs to be moved and signal with your arm outstretched to the right or left. When it is centred, raise your arm to the front that it is correct.